After reading my blog, go to this site and do the activity including the self test. Also, here are two links to a site about inducible promoters and another with a short list of available systems. Just scan them to get a sense of what is out there. In particular, you might want to read the short bit about the Lac promoter, towards the bottom of the chart on prokaryotic promoters. Also, this is an interactive demo that is moderately useful. You have to put all the elements in place on the "DNA" to see it operating. It works if you have JAVA running on your computer. If you have it blocked, it will download and you can tell your computer to run it. It is up to you. You don't have to do this one. An operon is a system that exists in bacteria, but not in eukaryotes, for regulating several genes together. Suppose, for example, you are a bacteria that sometimes encounters the sugar lactose. It would be good to have the genes for proteins to process that. You’d need a transport protein to get the lactose into the cell efficiently, and an enzyme to break the lactose into its components, Glucose (you know how that can be used) and Galactose (which you can also convert to glucose). That is the lac operon. And it serves as an example. A stretch of DNA that encodes several proteins on ONE mRNA. The ribosome will make all of them reading the same message. This does not happen in Eukaryotes. Promoter: a site on the DNA recognized by RNA polymerase (which carries it’s own transcription factor to bind the promoter sequence, in E. coli). Operator: A sequence in the DNA that binds another protein, called Repressor. When repressor is bound, the polymerase cannot get access to the promoter. A Repressor: The protein that binds the Operator and prevents transcription. It is usually encoded nearby, transcribed from another promoter. Importantly, the repressor has to exist in two states: One that binds the operator and prevents transcription of the genes and one that does not. 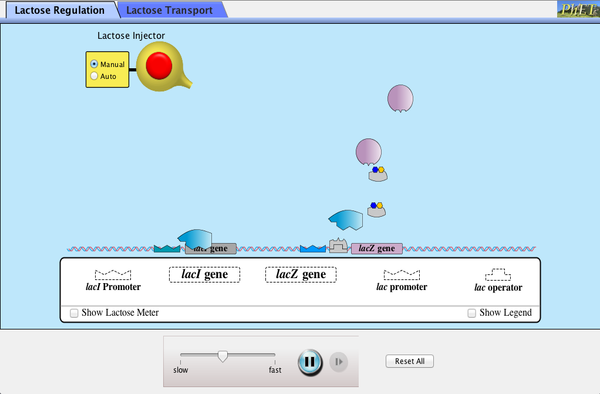 Effector molecule: molecule, such as lactose in the example of the lac operon, that binds to repressor and switches it between the two states. Below is a general picture taken from Wikipedia. 6, 7 and 8: the coding sequences for several proteins. In the first panel, the repressor is bound because the inducer is absent. RNA polymerase cannot gain access to the gene. In the second panel, the inducer changes the shape of the repressor, which causes it to release from the operator. Transcription can then occur. Note, that there are also cases where the repressor binds only in the presence of the effector molecule. So, you can turn off an operon when the effector is present. This is great for feedback inhibition. The Trp operon is an example of this and is described in the book.